Our retractable puzzle table has been improved. As you can see, even fully loaded, its stiff as a board! So after living with the new retractable puzzle table for a few days, I decided I could not live with the bowing center of the table any more. It turns out the PVC board I picked, was exactly the wrong choice. It does not offer the required stiffness for this project. I was originally thinking the problem lie with the table top material. I had considered going to a 3/4inch version of this to stiffen things up, but after thinking about it for a while longer, I decided the best upgrade would be replacing the supports with stiffer ones. It turns out however, this is still rather heavy to pull up and down on the system. My next upgrade is going to be adding purchase to the rope system. Currently the system is 1:1. Meaning we are not getting any mechanical assistance. The rope is attached to the table, goes over a pulley in the ceiling and then comes back down. I also changed to a 2:1 system. To do this, I needed a second set of pulleys and longer rope. I installed them as shown in the illustration below. This will make the table twice as easy to get up and down! If I am feeling really fancy, I will get some high tech rope that does not stretch so when you lean on the table it does not give and fancy sailing blocks for xmas or something. 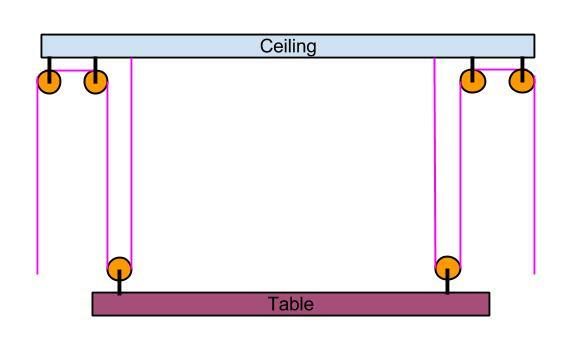 Someday, I will make this so that the entire table is flush with the ceiling and is remote controlled with special lighting! The 2:1 pulley system upgrade for our retractable puzzle table.